Please take a moment to check out this outstanding review of my newest book, “Georgia Remembers Gettysburg” from Joyce Faulkner, past president of the Military Writers Society of America. It is copied below for your enjoyment. “Georgia Remembers Gettysburg” is one of the finest books on the Battle of Gettysburg that I’ve ever read. It balances strategy, adventure, tragedy, and loss against time, memory, and perspective. Historian and author Keith Jones has a knack for seeing a picture in shattered shards of glass and has once again, as he did in his award-winning book, “The Boys of Diamond Hill,” created a mosaic of humanity that intrigues and moves the reader. In the Introduction, Jones describes the roles of the various Georgia Units serving in the Army of Northern Virginia as it moved North in 1863 — the Georgia Artillery, Anderson’s Brigade, Benning’s Brigade, Dole’s Brigade, Gordon’s Brigade, Semmes’ Brigade, Woffard’s Brigade, and Wright’s Brigade. This is usually where the story ends. However, with Chapter One, we realize that we will be seeing the events of late June and early July through the eyes of the Georgians who fought in a tiny Pennsylvania crossroads known as Gettysburg — through their notes, letters, diaries, and published articles. Some of these narrations were penned within a day or two of the event — some were recorded months or years or decades after the fact. Some tales reflect youth, local perspective, and excitement. Some are told with the wisdom of distance and age. I was amused to read how the various narrators saw themselves and their comportment at Gettysburg. Several expressed satisfaction at burning hated abolitionist Thaddeus Stevens’ Iron Works a few days before the battle — while at the same time, feeling offended that the Northern media blamed them for the burning of Wrightsville, PA. The gallantry of the times seems quaint now — a reflection of General Robert E. Lee’s orders and the innate rules of right and wrong carried in the hearts of the men themselves. They relished perceived support from the Pennsylvania locals — but mistrusted it at the same time. While determined to behave better as invaders than the Federals, it’s clear that many were regretful of the circumstances that drove them to personally take food from farms and homes. That the army took private property like horses seemed to cause less dismay — perhaps because that was expected on both sides. Another amusing story — reminiscent of the whisper party game — centered on General Gordon of “Gordon’s Brigade” coming upon Union General Barlow — mortally wounded — on the first day. He pauses to talk to the stricken officer and leaves him, assuming that he is doomed and will die where he fell. Years later, the two met again — each having believed for years that the other had died. Those basic facts took on mythic proportions as the story was told and retold with each narrator enhancing it. Although I chuckled as this incident was introduced in succeeding accounts, I was struck by how difficult it must be to confirm what did or didn’t happen — even in Gettysburg which has been so carefully documented by so many historians over the last century and a half. Participating mainly on the first and second days of the three day conflict at Gettysburg, the Georgia boys had good reason to feel that they were winning. Their performance was courageous and determined. Many were hardened by experience and moral certainty that their cause was just. On the first day, they captured and killed thousands of Federals — and chased the rest through the town to the heights on the far side. Many were distressed at the time…and even more so in the years after the battle … that they were ordered not to follow their foes and displace them from the prized “high ground.” Some believed that this one “blunder” as one soldier put it … led to the loss of the battle and ultimately the war. On the second day, soldiers who were reporting closer to the time of the battle without understanding the totality of the event, concluded that the Confederates must have or should have “won” the day. Their commitment was such that they attempted the near impossible as readers who might have visited Gettysburg can attest after seeing places like the Wheat Field, Devil’s Den, and Little Round Top. With the passage of time and a better understanding of the whole event, these soldiers seem proud to have fought against such odds — while continuing to grieve for the cost in lives and limbs. Keith Jones, by allowing the Georgia boys to report events as they saw them … and to comment about them, gives us not only eye witness accounts of a famous event but empathy and context in a way that most history books forget to include. It is a delicious experience that will keep you pondering for weeks. ** Although I have visited Gettysburg many times and have spent long hours at the locations mentioned in this book, maps with the movements of these specific units would have been useful. 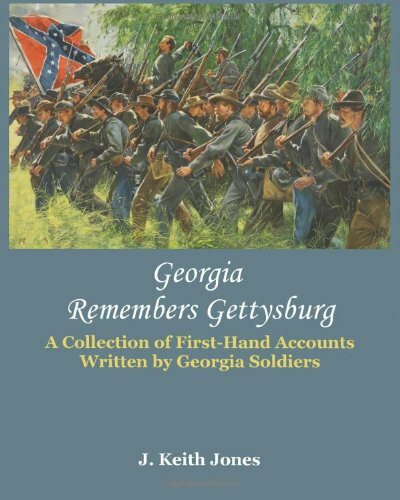 However, in total, “Georgia Remembers Gettysburg” is carefully notated and has helpful Appendices like “The Confederate Order of Battle at Gettysburg for Georgia Troops” and a comprehensive and logical Index.